3 Days of Giveaways! Two Great Cookbooks! I love a good cookbook. It might be bordering on obsession. They don't all fit in my kitchen anymore, so I've started storing some in a dresser in our guest room. Wanna come visit? Today, let's take a look at two cookbooks that were published this year that we haven't talked about yet on the blog. 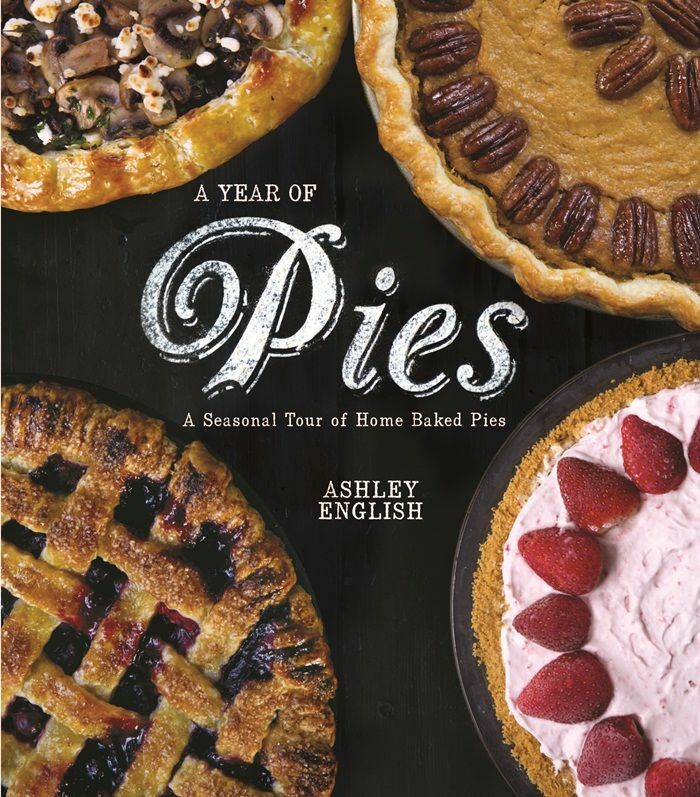 Well, if you love pie...and you do...you need this book. Not only is it a book of sweet pies, but savory as well. The book is divided by season, featuring seasonal ingredients at their peak. Gingersnap Key Lime pie? Mushroom & Chevre Galette? Yes, please. 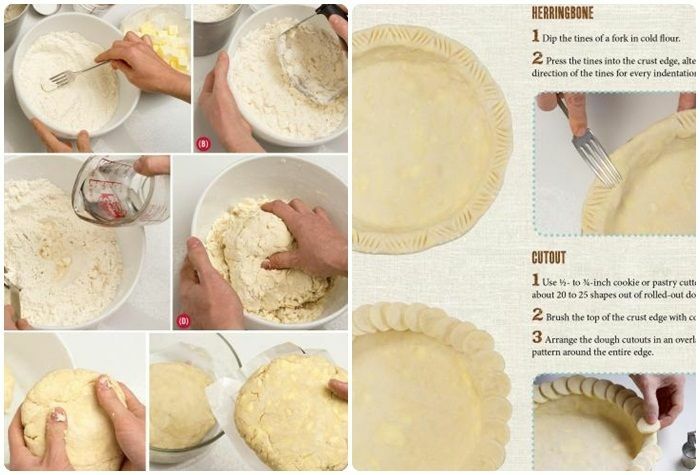 Ashley also walks you through the crust-making process...and offers really great tips on making pretty crusts. I don't know about you, but I need help in that department. It may be the middle of December, but I'm already dreaming of this frozen strawberry pie. I tried to resist buying this book. You see, I'm not just a cookie dough lover, I'm a cookie dough LOOOOOVER. I'd eat a bowl of dough over a regular ol' cookie just about any day. So, I was afraid for my waistline. Very, very afraid. So, I just admired it from afar. Then, I met the adorable Lindsay, and her equally adorable husband, and thought, "waistline be darned...I'm buying that book." Oh! Can we talk about Cookie Dough Cream Pie? 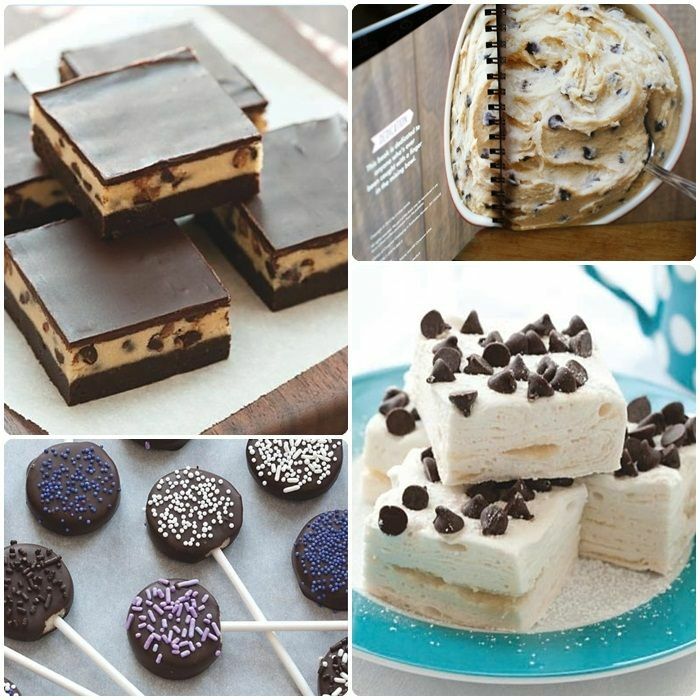 Or...Cookie Dough Brownies and Cookie Dough Swirl Marshmallows? Maybe it's not the best book for my waistline, but it's good for my SOUL. The winner of this giveaway will get to choose one of these lovely book for their own. Yay! To enter: leave a comment right here on the blog (if you're reading this in an email, click on the blog post title to open this post in your browser) naming of one of your favorite cookbooks, new or tried-and-true. For an extra entry: leave a separate comment telling me your favorite Christmas TV special or movie. Congrats to Molly who chose PIES! My favorite cookbook is David Lebovitz's "Ready for Dessert." My favorite recipes from there are the Irish Coffee Cupcakes, Fresh Ginger Cake, and Chocolate Almond Biscotti. 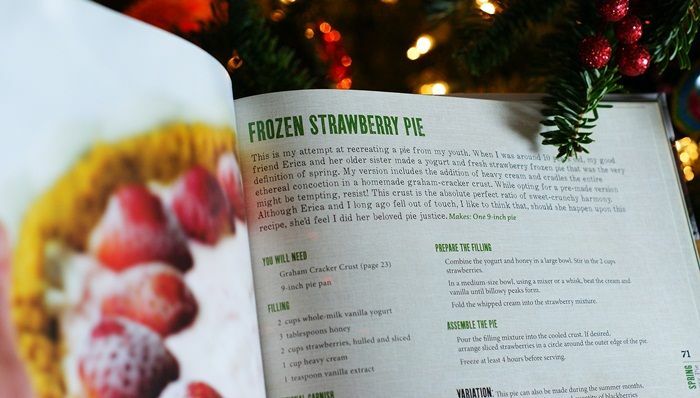 If I had to choose, I'd pick the pie cookbook! Again, making me pick favorites! I really like Martha Stewart's Cookies and the Sweet Melissa Baking book. My cookbooks have outgrown my kitchen and stacked all over the house. A Christmas Story is a great movie! All of the Barefoot Contessa Cookbooks are my favorites. Also, The Betty Crocker Cookbook. Thanks for the giveaway! My favorite holiday movies are The Holiday and Christmas Vacation. Home Alone is a great one too. I like the World Vegetarian cookbook. oops! meant to say all the America's Best Test Kitchen cookbooks...i love reading them cover to cover. Hm.. I'm only nineteen so my cooking is limited but my Betty Crocker book has been amazing so far! I also have a Hershey's one just for desserts. My favorite cookbook is the original Vegetarian Epicure by Anna Thomas. I've had it since I was learning to cook as a college student in the late seventies and it's still my goto cookbook for quiche, lasagne and a lot of other recipes. They tend to be a little heavy on the cheese, butter and cream compared to a lot of today's cookbooks, but they do come out tasty! And my favorite tv Christmas show is the original animated How the Grinch Stole Christmas. You're a mean one, Mr.Grinch. Love that song. I don't have either of those cookbooks, but they look delicious! My most used cookbook is a set of betty crocker ones that are probably older than I am! The spine are duct taped together! As for recent books, I love the sprinklebakes cookbook just to look at! Favorite Christmas special is that old stop motion (I think) rudolph one! Rebar is my go-to for absolutely everything!! My favorite Christmas movie is "White Christmas"! My favorite cookbook is Martha Stewart Baking. She kind of makes me batty but man can she bake! Also, my favorite Christmas movie is White Christmas. But with a 4yo, the old school Grinch cartoon is getting a lot of play! My current favorite cookbook is Cooking from Quilt Country. Every recipe I've tried comes out beautifully and tastes fantastic. Definitely not for the calorie conscience but delicious recipes. Secrets of Baking by Sherry Yard... GREAT book!!! My favorite cook book was put together by my mom and contains my family's recipes! I love any of Ina Garten's cookbooks! My favorite 'newish' movie is New Year's Eve, Zac Efron is just the cutest! Cooks Illustrated is my favorite cookbook. My favorite cookbook is one put together as a fundraiser in the 1970s by the ladies in the church I grew up in. Favorite Cookbook - Artisan Bread in 5 Minutes a Day. Looks so yummy! One of my favorite cookbooks is my 1974 copy of The Family Circle cookbook that my mother gave me when I got married. The recipes are not all great but I can always find the basics there. Favorite Christmas movie - still "Miracle on 34th Street"! I have always loved A Christmas Story! "You'll shoot your eye out kid". I enjoy the cheesey romantic Christmas movies on Hallmark, Lifetime, and ABC Family. Also ELF is a gas. The recipe book that I keep going back to, other than my Mother's hand written notebook of course, is Ready for Dessert by David Lebovitz! I love love love his recipes! My favorite is the same now as when I was little! The animated classic, "How the Grinch Stole Christmas"! Favorite Christmas movie is Polar Express. Love watching my children watch it. Plus I teach kindergarten and I have to watch it every year! One of my favorite's is Tea Time at the Masters - an old one from Augusta, GA. It has a lot of go-to recipes in it. My favorite is the Charlie Brown Christmas show. If I need a go to recipe, I stick with the better homes and garden one I got from my wedding. Truthfully I'm not a book girl though, I am a blog girl and I'll go to my go-to bloggers for a recipe. MY favorite cookbook is one given to me by my boss's wife for helping to proof it. She created it for her children and I absolutely love it!! Ratio by Michael Ruhlman is my favorite. With the basics you can do anything!!! I only own one single cookbook about appetizers which was given to me by my father. I think he gave it to me because he thought I needed to learn to cook. Baking is more of my thing ;) So I need to start up my cookbook collection! "A Year of Pies" looks like the perfect start! Home Alone is a fav. I have so many Christmas favorites but every year I must watch the Rockefeller Christmas tree lighting special. My tried and true favorite cookbook is probably Betty Crocker, but I love reading so many cookbooks, cooking magazines, and now blogs! My favorite Christmas movie is White Christmas!! In 1976 my mother gave me "The Better Homes and Gardens" cookbook, it is my favorite because it reminds me of her. The cookbook I tend to reach for most is my good old Better Homes and Garden with the red gingham cover. Pioneer Womans 1st cookbook is a close second. As for favorite Christmas movie, hands down it is "White Christmas". These two cookbooks look amazing! My own collection is not very large, but my go-to cookbook is The Kosher Palette by Susie Fishbein. Rudolph the red nose reindeer is my favorite movie. Great giveaways! this is tough a toss up between White CHTISTmas and It's a Wonderful Life, we named are baby boxer after the little girl in the movie, her name is Zuzu Bailey!! But I like the Nick Cage movie "The Family Man" too even though is not a CHRISTmas movie per-say, I still love to watch it this time of year!! OK I'll shut up now!! My favorite cookbook is The complete Americas Test Kitchen series. Favorite Christmas movie is A Christmas Story! I so rarely use a cookbook anymore. Growing up I loved to read a Better Homes and Garden cookie book from cover to cover. one of my favorite cook books would have to be one of the Moosewood cookbooks, but if we want to talk baking it is definitely Mom's Big Book of Baking by Lauren Chattman, so easy yet always so yummy and kid friendly! Favorite Christmas special is totally the Garfield Christmas special. I just really love Garfield, and it always makes me a bit misty eyed at the end. I have a Julia Child book I dearly love. Thanks! My favorite cookbook today (they change frequently) is Mark Bittmans How To Cook Everything: The Basics. I'm not a new cook, but I still learned a lot reading this book. Ina's cookbook's are definitely my go to. My favorite Christmas movie is Elf. My favorite Christmas movie is Elf...followed by Christmas Vacation, Fred Claus, The Santa Clause, and A Christmas Story...in no particular order. Cookbooks are wonderful- but my go to these days are creative blogs like yours! Learn so much and love the pictures. 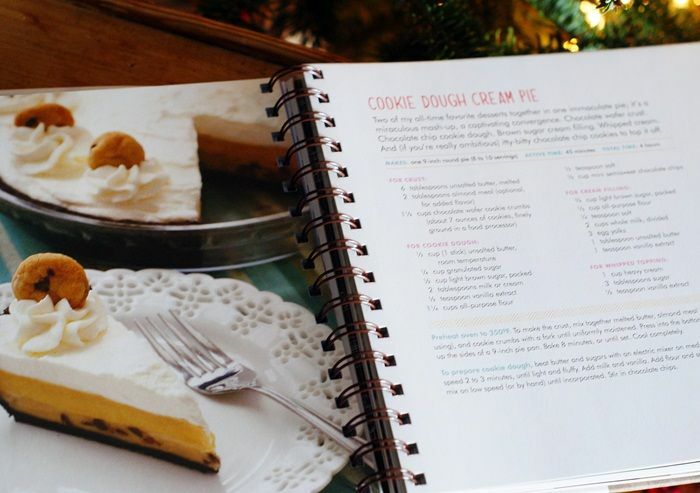 Have your cookie book already- it's beautiful! Thank you for sharing all your ideas-I hope I can bring smiles to others like you have. All time Xmas show is a tie. Between The Grinch cartoon and A Christmas Story with Ralphie and the family. Love those two Xmas shows. My favorite cookbook is a small book of collected family recipes! A Charlie Brown Christmas, hands down! and her son's cookbooks and I love all their recipes! My go to cookbook is a Taste of Homes Crock Pot special Edition. Picking a favorite cookbook? Yikes, that is difficult. Well, right now I am currently reading and loving My Berlin Kitchen but, my go to cookbook is California Sizzles. I love Barefoot Contessa's cookbooks! Tom Jones had a Christmas special years and years ago-- I think Cher was one of his guest singers -- and it was a rockin' time listening to those jacked up carols! My favorite Christmas TV special is the Rockefeller Tree lighting! My favorite holiday special will always be A Charlie Brown Christmas. When it actually plays on television, it's so fun to watch with a kiddo! I love the Baked Cookbooks. My favorite cookbook is one that has been past down in our family. It is old and full of hand written recipes. Lots of good yummy food in there! One of my favorite cookbooks is The Pioneer Woman Cooks. I have had a lot of fun trying out a bunch of her recipes. I have never decorated a cookie. I've always wanted to but an intimidated! A Christmas Story is one of my favorite Christmas shows to watch. This is so difficult! I love so many Holiday Movies but I think that my all time favorite which never goes out of style would have to be "White Christmas"
One of my favorite cookbooks is good ole Betty Crocker Picture Cook Book. I can always turn to Betty if I need some help! My favorite Christmas movie is A Charlie Brown Christmas. I love Snoopy! I don't have a favorite Christmas cookbook, but I do love my Better Homes and Gardens cookbook. That's an old standby! I love A Charlie Brown Christmas! My favorite cookbook is the Pioneer woman cookbook, I love the bright big photos. I absolutely love browsing cookbooks with a big mug of hot coffee, (or a shot of cold vodka! ), but my go-to is the Fannie Farmer Cookbook. Lots of good stuff in there! Oh my goodness, what a fabulous giveaway! I too collect cookbooks and have found myself "downsizing" over the years! I can tell you that I have a couple of cookbooks on my Christmas list this year including your new book as well as Pioneer Woman's new cookbook. My favorite is White Christmas! My favorite Christmas special has to be "How The Grinch Stole Christmas" - the 1966 version! My favorite christmas movie of all time is A Christmas Story. It plays on repeat all christmas day at my family's house. Awesome giveaway... ♥ my fav Christmas movie is the 1964 "Rudolph" with Burl Ives singing!!! I use the internet more than cookbooks, but I have Betty Crocker cookbook. My favorite cookbook at the moment is Pioneer Woman Cooks. Her recipes are so yummy, and I'm working my way through every recipe I want to make. I'm waiting to see if anyone read my Christmas list to get Back in the Day Bakery Cookbook though! ;D Could be my new favorite. Oops. I totally forgot my email address. ;3 I'm sorry! I couldn't live without the Cook's Illustrated The New Best Recipe Cookbook. It's hard to pick just one as I have quite the cookbook addiction :) I am really loving the Crockin' Girls Slow Cookin Companion right now though. My favorite cookbooks to read are the Gooseberry Patch cookbooks. I mostly use blogs for recipes though, but I love to read these cookbooks! I really love Momofuku Milk Bar. Everything I've made has been over-the-top delicious! My favorite Christmas movie is A Charlie Brown Christmas! Tried and true--I love my Better Homes and Gardens cookbook. I LOVE the Smitten Kitchen cookbook! My favorite TV special is It's a Wonderful Life, a classic! One of my most used cookbooks is "Sweet Serendipity" (http://www.amazon.com/Sweet-Serendipity-Delightful-Desserts-Devilish/dp/0789310759)...their recipe for Creme de la creme cheesecake, carrot cake, & Aunt Buba's macaroons are AWESOME! Ooops...I did my fav movie, first (Rudolph)!!! Taste of Home books are among my favorite cookbooks. I do have one book, it's a Top Secret Recipes book, that is used far more than the rest. There's a recipe for french toast and cinnamon sauce that we can't get enough of! I have a vast collection of cookbooks but I rarely use them the way I used to. My favorite cook book is the internet! Having someone post whats tried and true--and with so many photos--nothing is better. Larousse Gastronomique: The World's Greatest Culinary Encyclopedia! It's fantastic! My favorite christmas movie is Love Actually! My favorite cookbook is a tie between The Pioneer Woman Cooks and Paula Deen. My fav cook book is this indian book my mom actually made of all her recipes.. LOL.. Those recpise are my all time fav as its my mothers cooking..
My go-to cookbook is an original Pillsbury book that I received at my wedding shower. Over 15 years ago. I love my "Whoopie Pies" cookbook, and my Pioneer Woman cookbook. My favorite Christmas movie is The Year Without a Santa Claus - gotta love Heat Miser and Snow Miser! America's Test Kitchen books are my go-to books. I bought the cookie dough one for someone else, but wanted to keep it. Either sounds great. Maybe the pie one I need help in that department. My favorite cookbook is one that was put together by the ladies at my church about 60 years ago. Those old biddies can really cook!! Wonderful giveaway. Very hard to pick a favorite cookbook....probably my better homes and gardens baking cookbook. 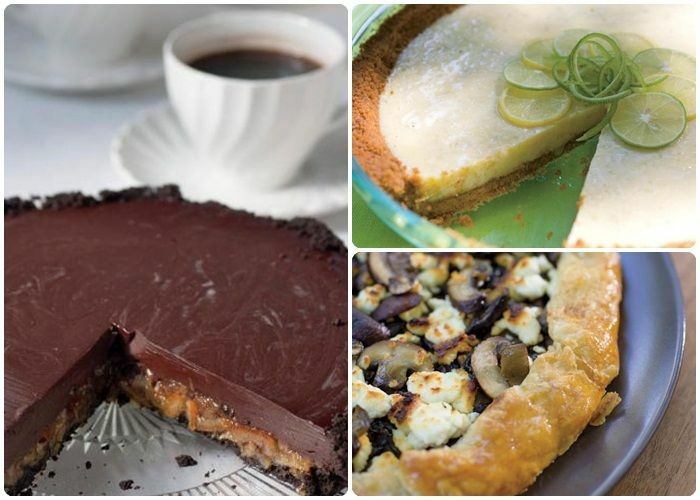 It has recipes for everything from cookies to savory pies. My favorite Christmas movie is National Lampoon's Christmas Vacation. It's a tradition!! Our family's favorite Christmas TV/movie tradition is It's a Wonderful Life on Christmas Eve...but we also watch a whole bunch of other good ones throughout the season. (The Grinch, Elf, Home Alone, The Family Stone and Love Actually). My favorite holiday TV show would be 'twas the night before Christmas. Just love the poem and the cartoon is sooo cute. How is one supposed to choose between both books? That seems an impossible task. My favorite cookbook? The green binder of holiday goodies my mom, my sister, and I started putting together so many years ago, of recipes we collected, then baked over Christmas break. I've since taken it over, adding to and subtracting from. Oh, and my favorite Christmas movie is Elf. I laugh so hard at the silliness. I LOVE the Pioneer Woman's cookbooks. They are my go to for new recipes. I'd love the Cookie Dough Lovers cook book. I have several favorite Christmas specials: A Christmas Story, Elf, and A Charlie Brown Christmas are just a few of my faves! 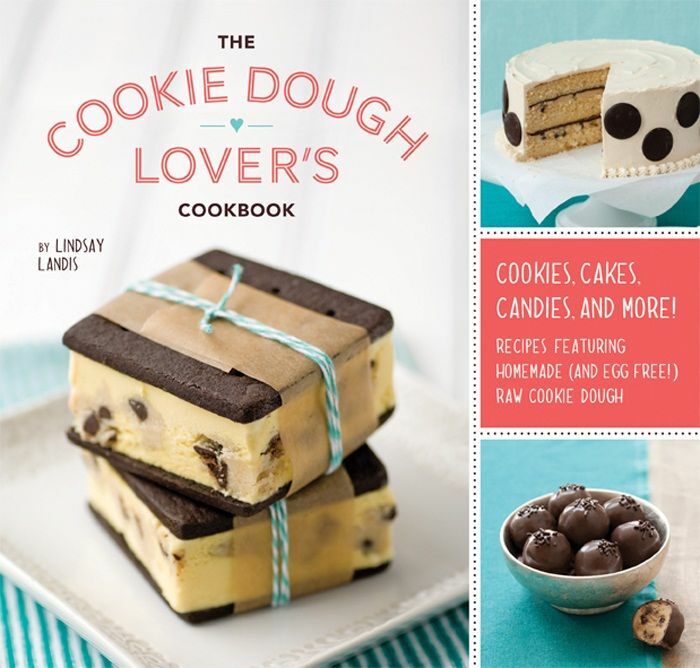 i would love the cookie dough lovers cookbook !!! my fave holiday special is the grinch that stole christmas ! I have enjoyed the Pioneer Woman cookbook this year. My faves are March of the Wooden Soldiers and Miracle on 34th Street. I have a Betty Crocker cookbook, printed sometime in the 1980's. I find myself consulting it often. In fact, just last night. Also one of my favourite cookbooks is a tattered and well used Church cookbook from a Women's group from the late 1970's. I make a recipe from it all the time called "Whipped Shortbread" and it's a cookie that I pipe and when you eat it, it just melts in your mouth. My favorite cookbook would have to be the King Arthur Baking book. My favorite Christmas movie is National Lampoon's Christmas Vacation. Have to watch it every year and it always makes me laugh.